A nearest neighbors data structure for roadmap vertices. Convenience function that sets the connection strategy to the default one with k nearest neighbors. If the user desires, the roadmap can be improved for the given time (seconds). The solve() method will also improve the roadmap, as needed. If the user desires, the roadmap can be improved until a given condition is true. The solve() method will also improve the roadmap, as needed. 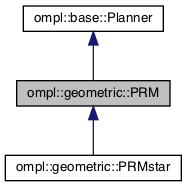 Attempt to connect disjoint components in the roadmap using random bouncing motions (the PRM expansion step) for the given time (seconds). Attempt to connect disjoint components in the roadmap using random bouncing motions (the PRM expansion step) until the given condition evaluates true. Return the number of milestones currently in the graph. Return the number of edges currently in the graph. Construct a milestone for a given state (state), store it in the nearest neighbors data structure and then connect it to the roadmap in accordance to the connection strategy. Make two milestones (m1 and m2) be part of the same connected component. The component with fewer elements will get the id of the component with more elements. Randomly sample the state space, add and connect milestones in the roadmap. Stop this process when the termination condition ptc returns true. Use workState as temporary memory. Check if there exists a solution, i.e., there exists a pair of milestones such that the first is in start and the second is in goal, and the two milestones are in the same connected component. If a solution is found, it is constructed in the solution argument. Sampler user for generating random in the state space. Access to the number of total connection attempts for a vertex. Access to the number of successful connection attempts for a vertex. Function that can reject a milestone connection. PRM is a planner that constructs a roadmap of milestones that approximate the connectivity of the state space. The milestones are valid states in the state space. Near-by milestones are connected by valid motions. Finding a motion plan that connects two given states is reduced to a discrete search (this implementation uses A*) in the roadmap. Definition at line 80 of file PRM.h. A function that can reject connections. This is called after previous connections from the neighbor list have been added to the roadmap. Definition at line 142 of file PRM.h. Definition at line 123 of file PRM.h. Definition at line 341 of file PRM.cpp. Set the function that can reject a milestone connection. is checked for collision and added to the roadmap. Other neighbors may have already been connected before this function is called. This allows certain heuristics that use the structure of the roadmap (like connected components or useful cycles) to be implemented by changing this function. connectionFilter A function that takes the new milestone, a neighboring milestone and returns whether a connection should be attempted. Definition at line 187 of file PRM.h. Set the connection strategy function that specifies the milestones that connection attempts will be make to for a given milestone. by varying the number and properties if the milestones that are connected to each other. pdef A function that takes a milestone as an argument and returns a collection of other milestones to which a connection attempt must be made. The default connection strategy is to connect a milestone's 10 closest neighbors. Definition at line 164 of file PRM.h.